To prevent any of the senses from losing its normal capacity, we must keep them in constant use - specifically in use for Krishna. The more we use our senses in Krishnas service, the longer they will function properly. Because Krishna sees that we are using the senses given by Him for what they are meant to be used, He will prolong their lifespan. Hare Krishna Welcome to new nabholingam.com website. 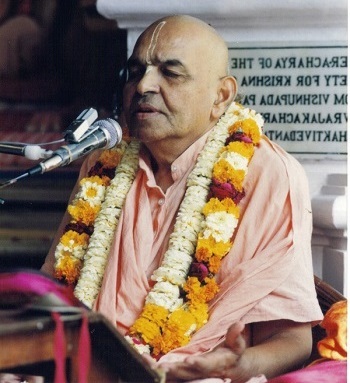 As before, this site is dedicated to HH Mahavishnu Goswami. This site allows you to hear audio lectures and their transcription. As our esteemed user you like to register your self and participate in the transcription service activities. We need volunteers to 1) Transcribe Maharajji's lectures 2) Review the transcriptions3) Improve the media files such as audio mp3 files.Even if you do not wish to volunteer now, please register in order to view the entire list of currently uploaded audio files.Some of of the new features of this web site includes:1) This web site is mobile device friendly. 2) Allows you to easily upload new media files related to Maharajji 3) Online transcription editing facility 4) Ability to search for text within the transcriptions5) News, web links, and guest book features.We are constantly trying to improve your overall experience visiting this web site, therefore, please give your feedback comments using guest book.wishing you a very happy new year Nabholingam Website Development Team. This is a reminder to let you know that the November yearly fundraising month for the nabholingam.com website is on. If you have already given, I earnestly thank you.You can observe that the website is free from any type of commercial environment. It is solely dedicated to HH Mahavishnu Goswami and his legacy. Nevertheless, there are expenses like maintaining a big server that can handle huge amounts of data (audio files being very heavy in MB). So, the money aspect is crucial and it is coming from persons like you who find the website’s contents useful.